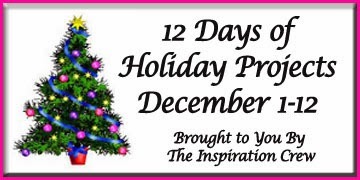 Welcome Day 8 of the 12 Days of Holiday Inspiration AND today I'm also participating in the Denami Razzle Dazzle Blog Hop (which starts at 9AM EST). I'm so excited to be able to participate again this month. I love Denami Stamps and I thought this little Denami Stamps Peek-a-boo Penguin in this circular sentiment was just too cute. Since I used two stamps, you can even use other images for the center. I colored the Penguin with Copic Markers and punched it out with a circle punch. I added Glossy Accents to the trim on the Penguin's hat and covered it with White Distress Glitter. Then I put it on a circle made from silver glitter paper. I've had this awesome ornament die for years, so I punched it using a teal color glitter paper and made the top of the ornament from the silver glitter paper. I put it on Real Red card stock from Stampin' Up. I hope it's enough Razzle Dazzle!! If you're following the hop you should've come here from the blog of the super talented Heidi Hurley at http://www.hurleyzfamily.blogspot.com/ and your next stop will be the blog of the very gifted Deb W. at http://mycraftroomcreations.blogspot.com/ If you just found out about the hop and want to start at the beginning go to the Denami Blog. Thanks for stopping by and below is the info on the 12 Days of Holiday Inspiration. Love this cute little fella sitting among the glitter! OMG! That little penguin in there is so cute! Awesome card! Great ornament image. Razzle dazzle indeed! Pretty ornament and the wee penguin peeking out...soooo cute! Adorable. Love his little hat! The glitter paper is gorgeous too! I love that little penguin. I have him too and have used him many, many times. Darling ornament card! Love the sparkle! Fabulously AMAZING color combo! I am sooooo loving all the non-traditional colors showing up this year! THEN THERE'S THE GLITTER PAPER!!!! Wow - what an impact against the red background! But that sweet wee guy with his glammed up hat brim totally steals the show, as he should! LOVE this sweet creation to pieces! What a sweet little penguin on your bauble! Glitter paper? Genius use of that for the ornament. And the hat on the penguin steals the show! Great card! So cute! That's a whole lot of glitter! So cute!! Love the glitter paper and the die cut! Donna, those papers are just gorgeous and I love the design of your card! Your adorable penguin in the center of your ornament is genious! Love it! I love your card AND your Corgi!!! Thank you so much for sharing!!! Cute card - love the sparkly ornament and the little penguin. I am all over that cute penguin inside that fabulous glittery paper ornament! Perfect for today's hop! Love this card the teal glitter paper is lovely and that penguin cute! The penquin is adorable and I love the glitter on his hat. I am a google friend follower. I love the idea of using what we already have. I have things that I put away and don't remember I bought! Building a house is a hugh project, good luck. Donna, this is fabulous! I LOVE this little penguin image and he IS perfect for these round sentiment stamps. LOVE your creativity and flawless execution! Wow! That is a lot of bling and I love that cute little penguin! is so cute! I'm following also. Very cute penguin and I like the sparkly ornament. Love the sparkly ornament and thanks for reminding me that I have that cute penguin stamp! I'll have to dig him out of hibernation, lol. This is so so cute! The ornament and that sweet penguin are perfect together! Donna this is perfectly precious and I love all of the sparkle!! So happy you could hop with us! Oh my gosh...this is so cute! I love that little penguin! That sparkly ornament is FABULOUS, and I LOVE that sweet little penguin!!! Soooo cute! I've always loved that li'l penguin! Too cute; I'd want to hang him on our tree! How glittery and fabulously fun--love this!! ok seriously loving that glitter paper.. this is really adorable..